I always knew I would love diving. I always knew I would love diving. For years, as a young man, I had this recurring dream. In it, I was swimming effortlessly through the deep ocean, breathing as you or I would on dry land without effort. I would have this dream anywhere from two to six or seven times a year over a period of perhaps 10 years. In 1985, I went to Maui for a much needed break from a low point in life (think business failure, relationship failure). While I was there, I did my first dive. They called it a fun dive as I don’t think the term DSD (Discover Scuba Diving) dive existed then. We sailed across to Lanai eating breakfast on the Sea Smoke, a sailboat owned by James Arness of Gunsmoke fame. I remember it vividly. We were given basic instructions on how to clear our mask and what to do if our regulator came out (calmly reach around and stick it back in your mouth). 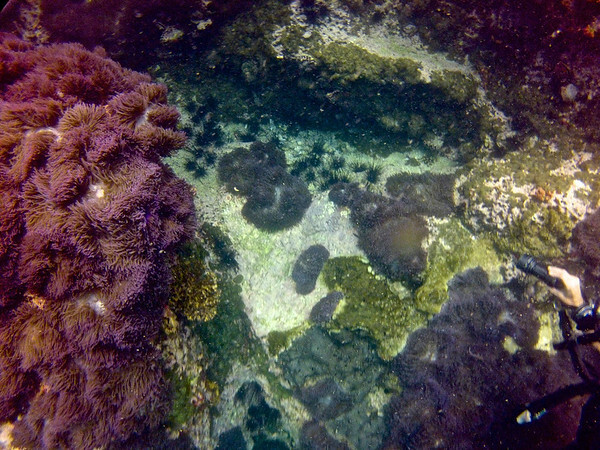 The water was so clear where we anchored that you could see the coral reef about 10 meters (30 feet) down from the boat deck. My buddy Rob and I had our own instructor and down we went! The textures were unbelievable. I was so overwhelmed with appreciation that I thought my heart would explode. Then we began to swim around and it was just like my dreams. The coral was technicolored brilliance. At one point a large turtle swam by and I stroked its back I was in heaven! I was hooked. Later on the boat, the three of us talked about the dive while the crew got lunch ready. My instructor (whose name has faded from memory) said, “You know, I have taken hundreds, probably over a thousand people on their first dive but I never saw anyone take to it as naturally and readily as you.” Then I told him about my dreams and a look of something akin to recognition filled his face as he smiled and slowly nodded. He then told me that his dream was to build a sailboat and sail around the world diving as he went. I knew then that I wanted to become a certified SCUBA diver. Well, life went on. I started a second career as a chef and after awhile helped to found HeartMath® a scientific research and corporate training organization where I became a chef for 15 years. Almost five years ago I decided to take a year off work and travel. I have yet to stop. Two year ago I started this blog and returned to Central America. When I was in Central America two years ago, I thought for sure I would get my PADI certification; however, various other travel adventures ensued. 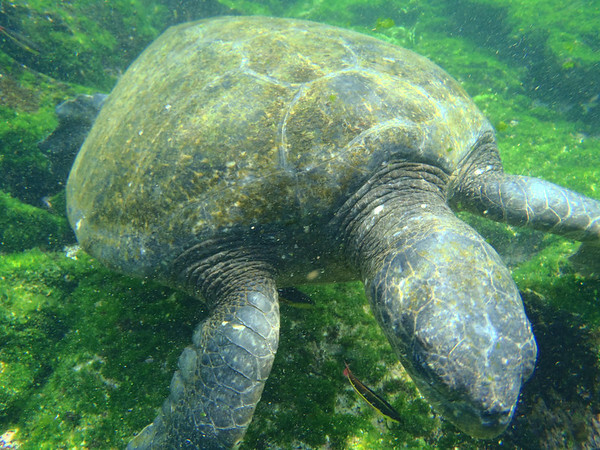 In the Galapagos Islands, I snorkeled every day for two weeks while Marine iguanas, Giant Sea Turtles and Galapagos Sea Lions cavorted around me without fear. I thought often about diving but there were no opportunities to learn on that trip. Last year I was around world class dive sites in Bali, Java, New Zealand and Fiji. 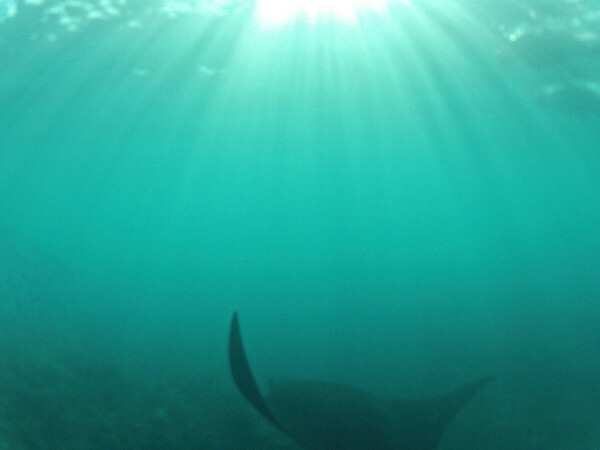 Rather than spend the larger sums required for courses in these areas, I settled for some great snorkeling including swimming with giant Manta Rays in Fiji. Well, at last my moment has come! Well, at last my moment has come! Originally planned for March and moved ahead two months due to my accident, I arrived in Koh Tao two weeks ago. Relying on a little research and a recommendation from two Swedish sisters I met while summiting a volcano in El Salvador, I hooked up with Davy Jones Locker, one of 50 or so dive companies on this small island. My four day dive course was brilliant and my instructor, Schmike, was great. I came prepared with two signed medical releases and proceeded to immerse myself in the course. After two days of mostly classroom and pool instruction, the last two days were all about open water diving. The weather was great and the water temperature was like lukewarm bath water. I did not even need a wetsuit. We saw Giant Grouper, a school of White Snapper, Barracuda, Blue Ringed Angel Fish, beautiful hard and soft coral and a host of sea life. The camaraderie among the group was great and I may even return in a few weeks to take an Advanced Open Water Certification course (AOW). Next up, I took a ferry south to Ko Pha Ngan and did two fun dives off the legendary Sail Rock. Although noted for frequent Whale Shark sitings, we were not fortunate in that regard. However, there was much sea life and even a decent down a chimney to 22 meters (shhh…I am only certified to 18 meters but my French divemaster had it all under control). There were eight on our boat with widely varying experience levels from newbies to professional instructors on holiday from Greece. The boat was very professionally run. 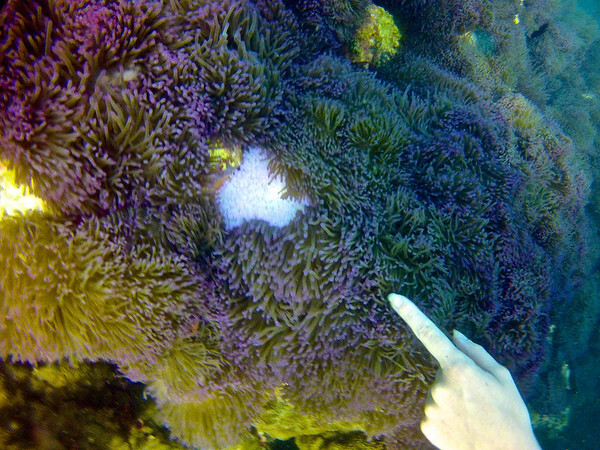 here in the middle of purple soft coral. As I write this first draft, I am on a ferry sailing south from Ko Pha Ngan. I am headed to the Andaman Sea. It is late in the season on the western coast and there was an early isolated monsoon last week. But I want to dive some more. Yes, I fear I am becoming addicted and there is no cure except to dive. The Similan Islands are already closed until October. But I plan to dive off Railay Beach, Ko Lanta and Tarutao National Marine Park near the Malaysian border. All of these places are noted for extraordinary dive sites. I have been doing a lot of research and with my limited weather window, I plan to cherry pick some of the best while here. Congratulations on finally fulfilling a long time dream! I can think of a lot of worse things to become addicted to! Cant wait to see more photo’s and descriptions of your new obsession. Thanks Brian, more photos and dives to come for sure! Thanks Lloyd and great to hear from you. Now you can say your cuz ‘swims with the fishes’ with a smile. That Russian River trip you’re involved with organizing sounds great and sorry to be on the wrong side of the world for that. I’m sure you’ll love it. Super cool that you’re finally able to swim w/ the other fish! You are in your element for sure! Now you get to travel and visit the underwater sites of the world in addition to the earthbound ones – how great is that?! Happy for you~sounds like you’ll be staying in that part of the world for awhile to come. So great. Both of us thinking of you and enjoying your travels. Thanks Judie. It has definitely been one of the high points of these recent years of travel for sure. Loving Thailand more than ever now. So glad you’re finally getting to do what you went there for!! Looks amazing!!!!!! Where’d you get the underwater camera? It’s a GoPro Hero 2. I bought it two years ago. Used a red snap on filter to balance some of the excess blue you get below a few meters. 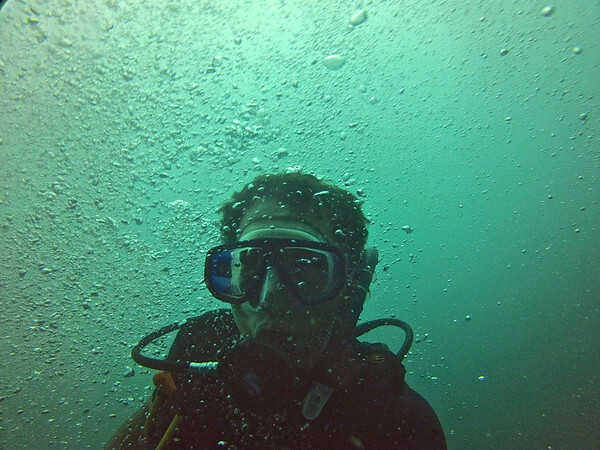 Hi Phil, it’s Will (from Liverpool, England) who you did you Open Water Diving Course with at Davy Jones Locker, Koh Tao. I just remembered your blog address and thought I’d have a look. Hey Will, great to hear from you. I’ve done four more dives since our course. I am loving diving. It was great to hang out with you and Paula and I will check out your blog for sure. Cheers! Congrats! I was lucky enough to get certified early through Boy Scouts and PADI. 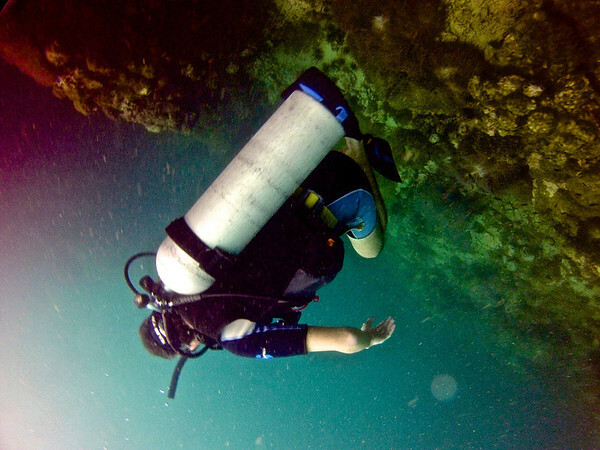 Diving really is like entering a new world! I can’t wait to hear about where else diving takes you. We had some amazing dives off Apo Island in the Philippines. If you’re in the area we would definitely recommend it. Thanks for sharing! Thanks Dan. I will definitely put Apo Island on the list. I’m planning to check out the Perhentians in a couple weeks as they are close by. 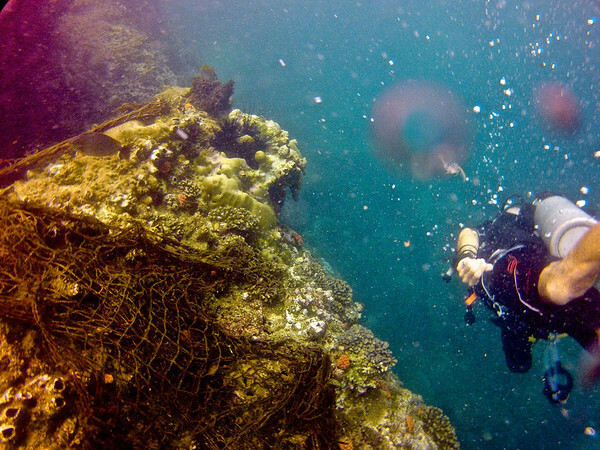 There are so many great dive sites in SE Asia. I can’t wait to explore more of them. Thank you for your comment Jack. Since I wrote this last year, I have gone on to Rescue Diver and completed 45 more dives. I checked out your dive camp website and it looks great. If you would be interested in having me review your your camp please contact me.